Between work and weekends away, September was full. I started the month by participating in two back-to-back swim races—the first a 2-mile swim in the Merrimack River, and the second a 1.4-mile ocean swim in Cape Cod. I should probably preface this all by first telling you this: swimming in races, or competitively at all, is very new to me. I’ve never been on a swim team, or done a triathlon, or anything like that. I swam a lot as a kid, but that’s about it. My close friend, Jen, however, is an accomplished swimmer and equally great cheerleader. After a few lessons with her last year (in which I actually learned to breathe properly while doing laps—eureka! 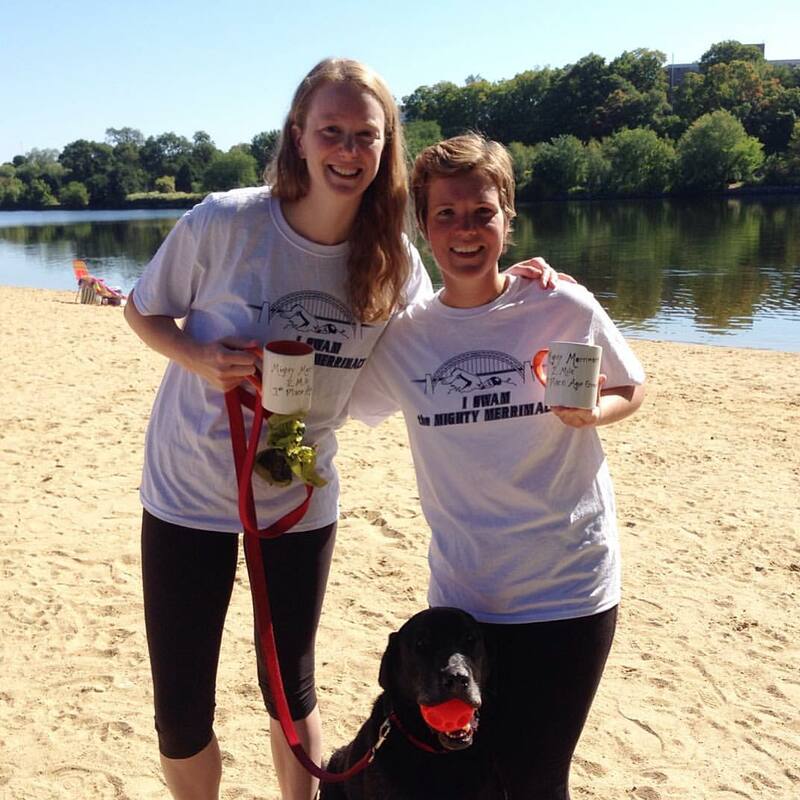 ), I felt good enough to try the 1-mile version of the Merrimack swim. I survived, and vowed to do it again this year, only this time aiming to complete the 2-mile stretch instead of the one. I also decided to finally join her for the ocean race, which I wussed out of last year because 1) shark sightings, 2) choppy waves, and 3) fear of swimming the wrong way into the great abyss. Alas, both were great events. Exhausting and humbling too (the 60-70 year old bracket is NO JOKE). My favorite by far was the ocean swim. Over 400 swimmers, amazing views, great crowd, and a chance to swim in the open ocean—it was a really cool 53 minute moment. After the swims followed a work trip to Pennsylvania (during which I also visited my sister and her family, woohoo), and then my birthday. And here we are. October. One of my very favorite months. For eating and for just being. And also for wearing scarves. 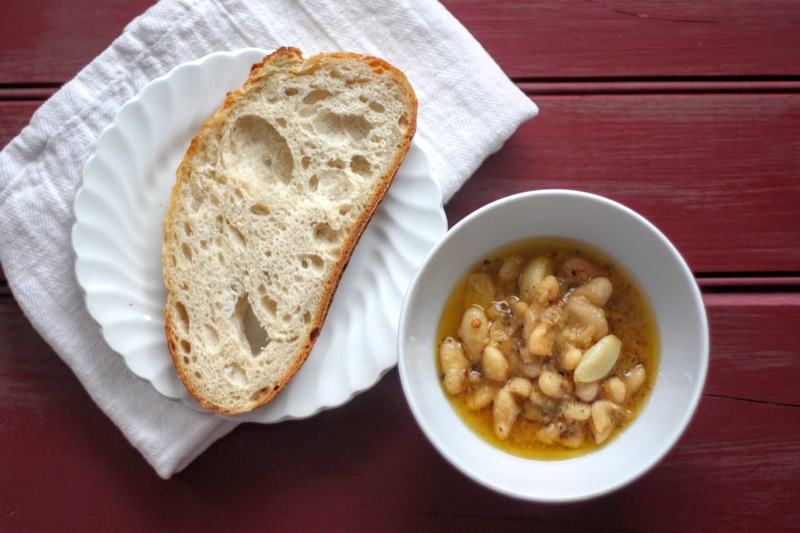 Continuing on this fall theme, I’ve wanted to post this recipe for white beans for a while now. I have been making them for years and it’s another staple in our house, especially in these cooler, heartier months. We eat beans and lentils a lot, a fact which I’m sure I’ve mentioned before. They’re such a great protein source and I find them especially perfect for incorporating into packed lunches. 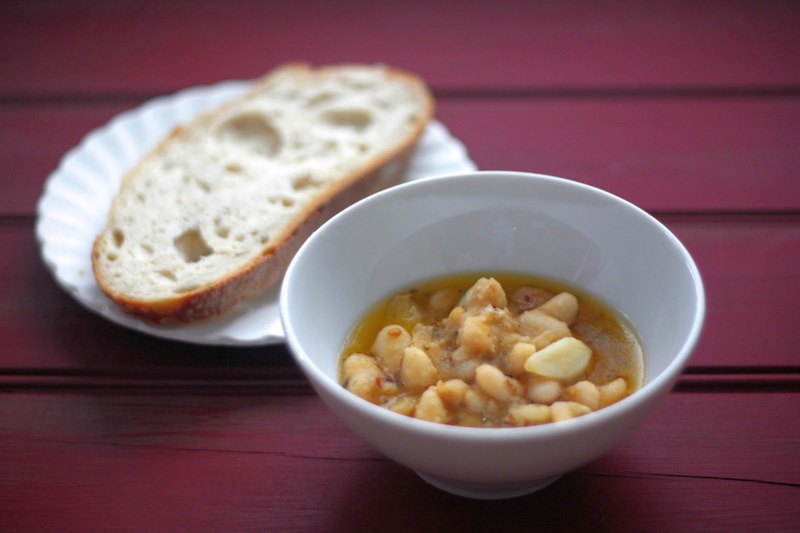 This particular recipe is dead easy too—cook your white beans (or use canned), then simmer them in olive oil, garlic, and maybe a few spices until they’re silky smooth and flavorful. The recipe is very similar to the garlic confit I talked about here (tip #7), but probably even more versatile. You can eat the warm beans and oil with bread, toss with pasta, mix into salad (the oil is an instant dressing), spoon over cooked chicken and rice, or purée into hummus. And because oil is a natural food preserver, you can keep a jar in your fridge indefinitely, pulling it out whenever inspiration, or time, is running low. You can always use canned white beans in place of cooking your own—I just prefer doing it myself as it’s cheaper and I prefer the taste. If you end up cooking too many beans, just toss the extra in a freezer bag and lay flat to freeze (as I mention here—see tip #4), then crack off a chunk whenever you need them. Spices: red pepper flakes, dried basil, oregano, etc. [If you’re using canned beans, skip directly to the next paragraph.] Drain and rinse the soaked beans and transfer to a cooking pot. Cover with at least one inch of water and bring the pot to a boil. Reduce to a simmer and cook until tender—this usually takes around 20 to 30 minutes but will depend on the size of the bean and how long you’ve soaked them for. You want them cooked all the way through and somewhat tender, but not falling apart. Drain the beans well and return to the pot. Cover with enough olive oil to cover by about 1-inch. Yes, it’s a lot of oil, but it can be used/re-used in tons of ways! Even if you end up eating all the beans out of it later, the garlic-infused oil that remains is great as a salad dressing, as a bread dip, or drizzled over pasta. Heat the beans and oil on low until you start to hear the oil sizzling a bit, but not popping like crazy, which would be dangerous. Add the salt (a generous amount—I probably use a teaspoon of kosher salt at least), garlic, and any spices you like. I use the three spices listed above—a big pinch of each. You’ll have to taste as you go along for seasonings, but just add whatever looks good to you. You could also add garlic powder, fresh herbs, or even a few tablespoons of pesto. Cook on low for 20 minutes or so, until the seasonings are fragrant and the beans are really tender—it’s okay if they start falling apart. Just be careful not to let the garlic brown (instead of leaving them whole, you can also finely grate/microplane the cloves, which allows them to just melt into the oil—both are excellent). Once the beans are silky smooth, remove from heat, cover, and let sit until warm but not hot. Serve however you like (see suggestions above), or transfer to a large glass jar and refrigerate—it will last indefinitely so long as the oil is covering the beans completely. I’d argue it even gets better with age. We are a soup-loving household. I grew up on homemade chicken noodle soup; Suraj on dal and sambar. The roots run deep. Soup ticks all our boxes. Can it be made in advance?—check. 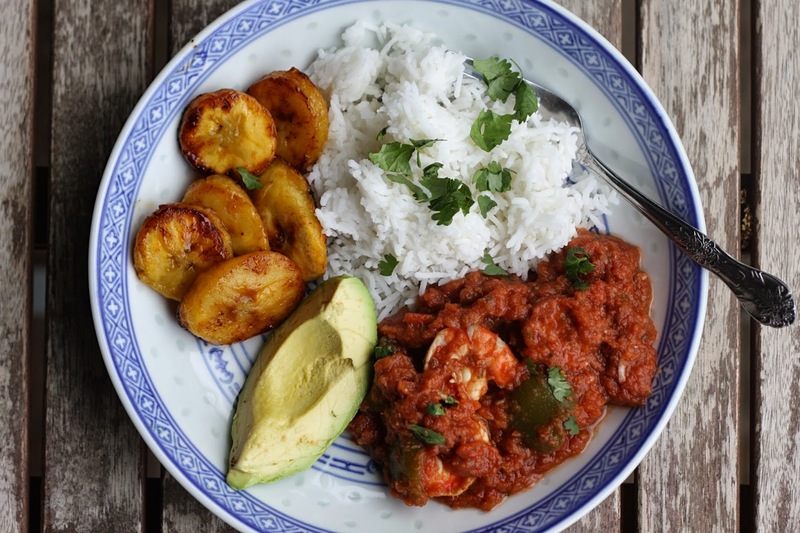 Is it a one pot meal?—check. Does it contain vegetables?—check. Does it contain protein?—check. Can it be eaten with bread?—check check check (okay, this last one may just be me…). 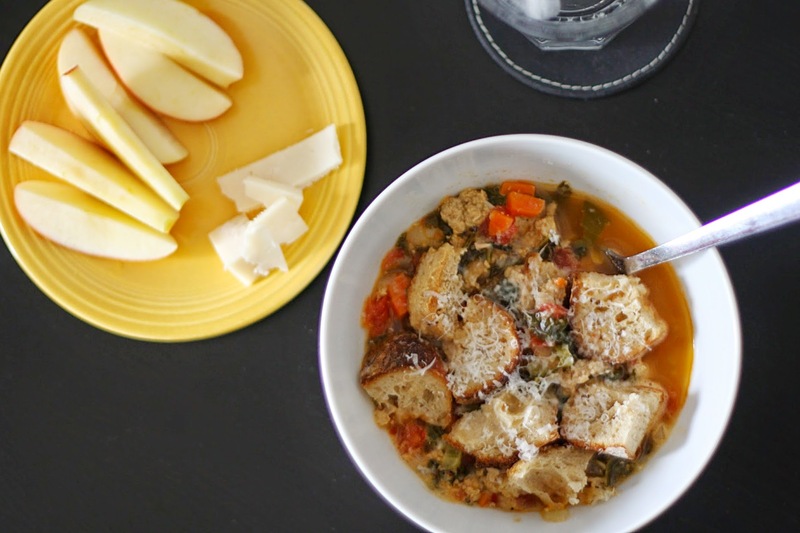 Ribollita is one of our very favorite soups and on an almost weekly rotation here. It’s Italian—Tuscan, to be precise—and features veggies, beans, and bread, which in my mind, is the ultimate trifecta. We add sausage as well (mostly to satisfy Suraj’s usual “Where’s the meat?” question), but seeing as it’s a soup with peasant origins, this can easily be skipped should you so choose. I’ve made both versions, and neither lasted long. Finally, it’s worth mentioning that the leftovers here are actually better than the first serving, which makes the next day’s lunch something to really look forward to. I have one last bowl left for tomorrow, expertly hidden in the back corner of the fridge. Territorial? Maybe. Smart? Hell yes. Quite a few ingredients here can be substituted as you like. You can use either hot, mild, or sweet Italian sausage, or skip entirely if you’re vegetarian, and just start with sauteing the vegetables in a little olive oil, and then using vegetable stock later. You could use celery instead of kale stalks (as is traditional—I just didn’t have any and didn’t want to waste the stalks). And/or you can skip the white wine and use more broth instead (though most of it cooks off anyway—and it imparts a perfect tang, in my opinion). You can also add in any other veggies you like, such as diced zucchini or cubed potato (which is especially good if you’re doing a vegetarian version). Play around! It’s only soup! // Adapted from Bon Appetit. // Serves 6 to 8. Preheat oven to 350°F. Toss bread cubes and olive oil on a rimmed baking sheet. Toast, tossing occasionally, until golden brown and crunchy, about 15 minutes. Let croutons cool. Using your hands, mix sausage and wine in a medium bowl until smooth. Transfer to a large soup pot set over medium heat and cook, stirring occasionally, until firm but not browned, about 4 minutes. Add onion, carrots, kale stems, and red pepper flakes. Cook, stirring occasionally, until vegetables are tender but still hold their shape, 20 to 25 minutes. Add kale leaves, tomatoes, beans, and broth and bring to a boil. Reduce heat and simmer, stirring occasionally, until flavors have melded, about 1 hour. Add kosher salt and pepper to taste. Divide soup among bowls and top with croutons and a grating of Parmesan. *Ribollita is the landing place of all the little knobs and crusts of sourdough that don’t make the toast cut but that I can’t bear to throw away either. I save them up in my freezer, and when my bag is full, the soup pot immediately gets turned on. That said, any type of hearty bread will work just fine. We recently used some garlic Tuscan from Wegman’s (!) and it was perfection. Have you ever wondered how, no matter what Thai restaurant you go to, the curries taste almost exactly the same? Thai green curry here = Thai green curry there, and so on. Either there’s some really phenomenal master recipe they all keep sharing, or they’re all using the same (ready-made) curry paste. Spoiler alert: I’m 99 percent sure it’s the latter. I certainly don’t blame them though. Curry pastes are a very complicated thing. They require a long list of ingredients, many of which most of us don’t readily have access to (lemongrass, galangal, kaffir lime leaves, etc. ), and a good deal of measuring, chopping, blending, pounding, and so on. I remember making one once, and it took me the better part of an afternoon. If the end result had been outstanding, it might have been worth it, but sadly, it wasn’t. Enter Maesri-brand curry pastes, aka small little tins of magic. I read about them on an Asian cooking blog years ago, and bought a can the next time I was at our local ethnic grocery store, because, to my amazement, it only contained real ingredients. Here is the label for Maesri’s red curry paste: “Ingredients: dried red chilies, garlic, shallot, salt, lemongrass, sugar, kaffir lime, galangal, spices (coriander seeds, cumin, cardamom). Product of Thailand.” Amazing, right? No fillers, no food colors, no things-you-can’t-pronounce. Better still, the flavors will blow you away. 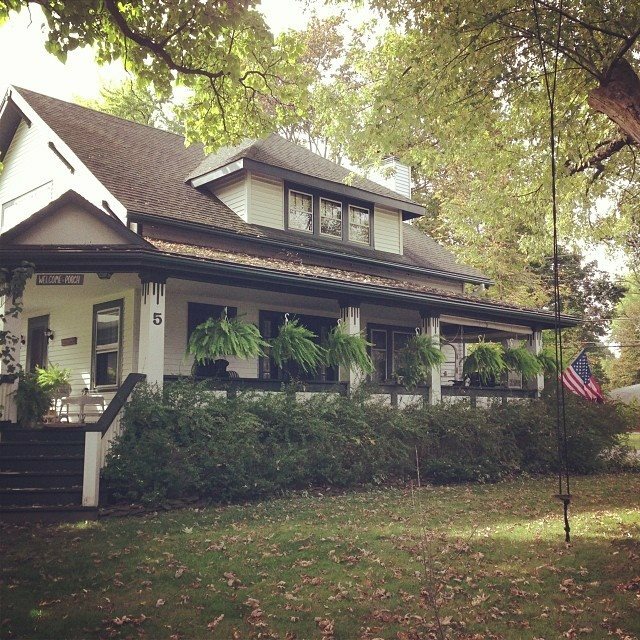 It’s restaurant-quality… quite literally. 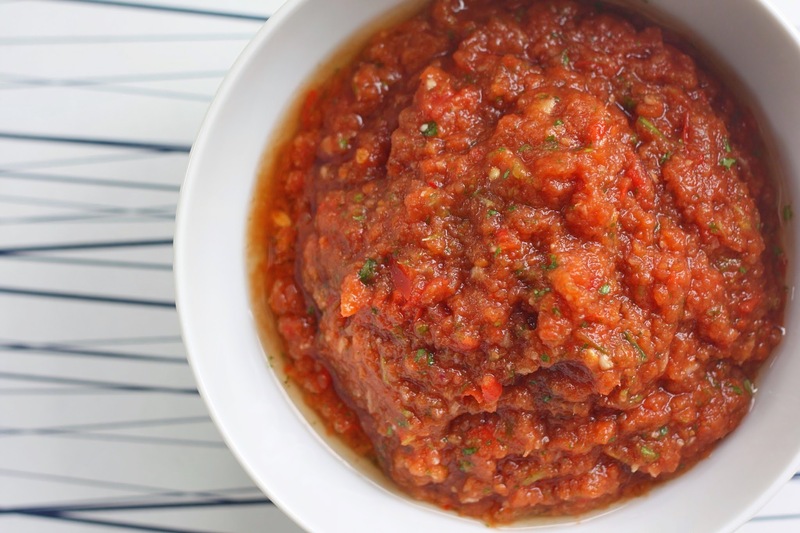 It’s probably already assumed that we eat very few canned/packaged goods in our household, which is true, but we do have a few exceptions: diced tomatoes, coconut milk, and this curry paste. 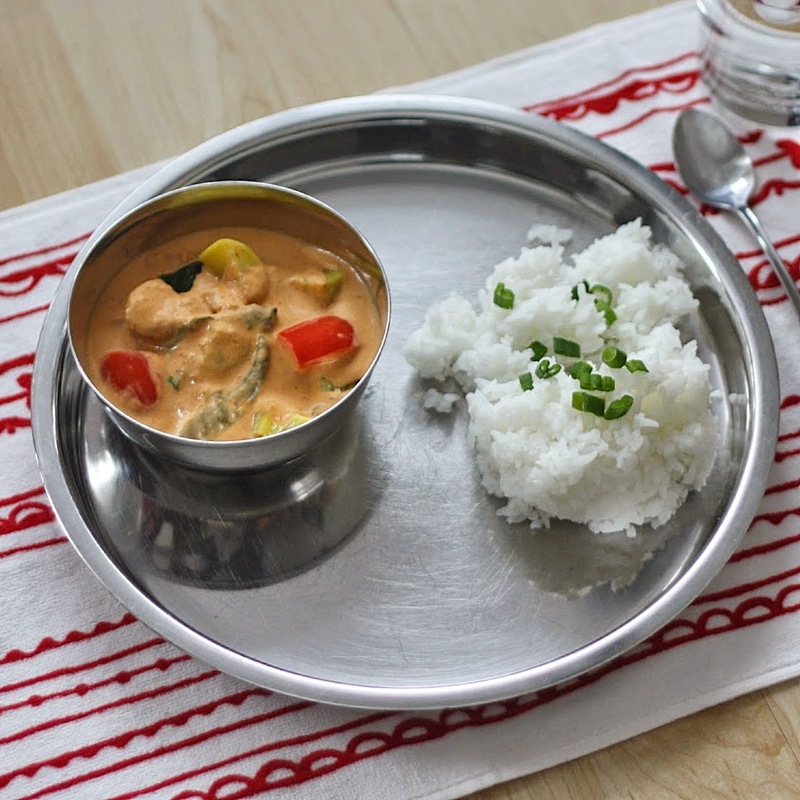 The last two combine to build the foundation of the wonderful Thai red curry recipe below. Add in whatever meat/veg you like, boil up some rice, and in less than 30 minutes, you have one fantastic meal on your plates. It’s one of our weeknight staples. I hope it becomes one of yours, too. A few notes: You can really use any vegetables or protein you want (or skip that part and make it vegetarian). In other iterations, we’ve used shrimp, mushrooms, water chestnuts, bamboo shoots, and asparagus—all with great success. You really can’t go wrong. As for the coconut milk, I always use full-fat because I love how thick and creamy it is… and because I truly believe that healthy, unadulterated fats are better for you than “skim” anything (if you really want a lighter version though, just use one can of coconut milk + water). 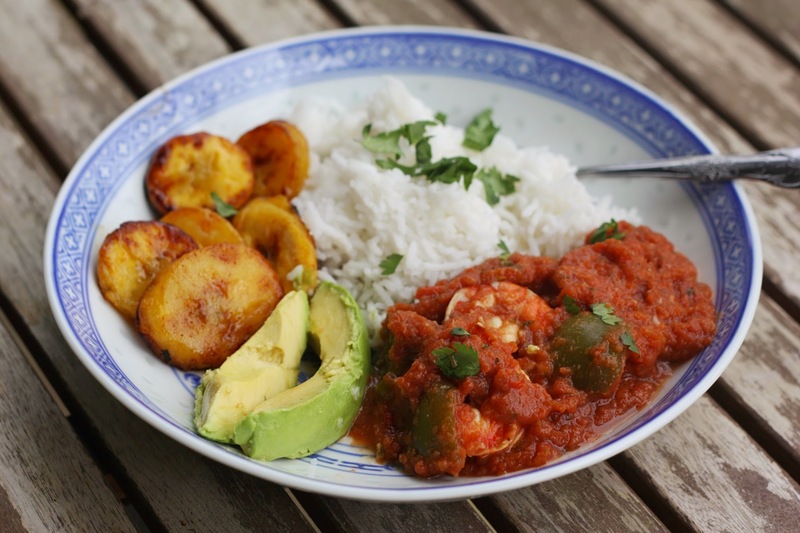 Combine the curry paste and 1 1/2 cans coconut milk in a large pot or saucepan, whisking to combine. Bring sauce to a simmer over medium high heat, stirring occasionally with a spatula so it doesn’t scorch. Once hot, add the chicken pieces and simmer for 20 to 30 minutes. (If you’re using chicken breasts, this will probably take less time. We always use organic chicken thighs because they have more flavor and are absolutely delicious when cooked in sauce or for long periods. Instead of becoming stringy like breast meat, they become mind-bendingly soft and tender. I encourage you to give them a try even if you “think” you don’t like them; I’ve converted quite a few people who were previously on the fence about them). Add remaining coconut milk if you think it needs it. Once the chicken is done, add all of the vegetables and cook for another 3 to 4 minutes only, until vegetables are just cooked, but still have their color and a little bite. Add salt if you think it needs some. Garnish with scallions and serve hot with rice. My favorite way to cook jasmine rice: Rinse grains thoroughly and soak in water for 15 to 30 minutes, while you’re preparing the rest of your meal. –> Bring a large pot of water to a boil. Add drained/soaked rice and boil for 10 minutes, just as you would pasta. –> Drain and return rice to pot. Cover and let sit/steam for a few minutes. Serve hot. 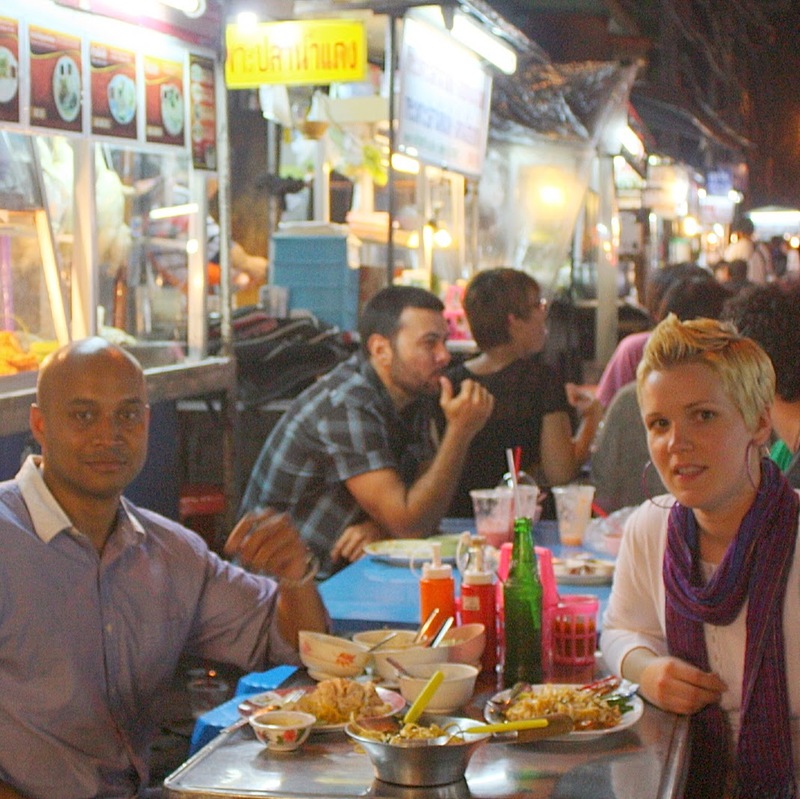 Eating our way through Bangkok, Thailand in 2011. Any country where street food is the food is a country for me.